roots of the grass. It will take a fungicide to control the fungus. So if you start to notice an irregular patch in your yard that is yellow and reddish-brownish you will want to contact us to see what needs to be done. We will have to treat the area accordingly. 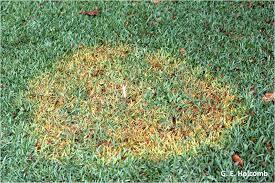 Brown patch can damage the yard significantly so its not something you should just over look.